Don’t waste your time reading this. Just click ‘Play’ and listen. 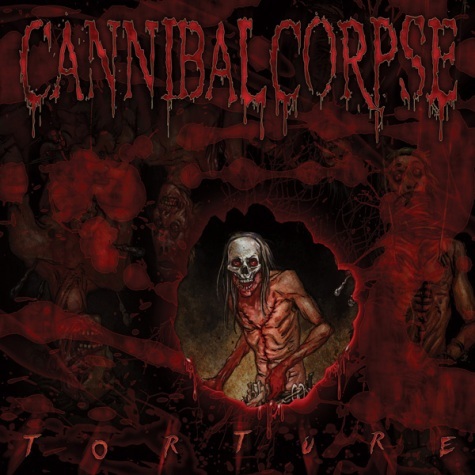 Cannibal Corpse, one of the most influential death metal bands in the world, is back with album number twelve, Torture. And yep, it’s another gruesome, chaotic, cacophonous, crushing and relentless battery. ‘Demented Aggression’, a song that will no doubt become a staple in future set-lists, is fast and brutal in every way possible. The lyrics (and Fisher’s savage delivery), the riffs, the drums, and the lead break are intense. ‘Sarcophagic Frenzy’ slows the pace slightly for a crushing track, again, O’Brien’s lead work slicing through the barbarity. ‘Scourge of Iron’ drags the tempo even lower that is no less devastating than the first track, the slow pace allowing what they’re doing to be savoured in all its grisly glory. ‘Encased in Concrete’ rapidly shifts the album back into the high gears, O’Brien’s lead-work blasting out in the introduction and thanks to the excellent mix, Webster’s bass-work shines through. From here on in, it’s more of the same. But with Cannibal Corpse, “more of the same” means more of the best death metal you’re likely to find for what remains of 2012. Erik Rutan returns for production duties and does a stellar job, each instrument given clarity, space, and smash-in-the-face intensity. As mentioned above, Webster’s bass-work is breath-taking – check the bass break on ‘The Strangulation Chair’. That alone is worth the asking price. Fisher does his thing and does it as well as ever. O’Brien and Barrett are as tight as a virgin’s you-know-what from which, according to Cannibal Corpse’s medical expertise, entrails may be quite easily removed (don’t try this at home, kids), and O’Brien’s lead work is as flesh-tearingly sharp as a rusted razor blade. And Mazurkiewicz’s drum-work is flawless. Together, the collective known as Cannibal Corpse have produced another killer album. If you didn’t like Cannibal Corpse before, Torture may do little to change your mind, but it’s your loss. Now that you’ve wasted your time reading this far (hopefully), go buy it. Now. Go on, just click here.